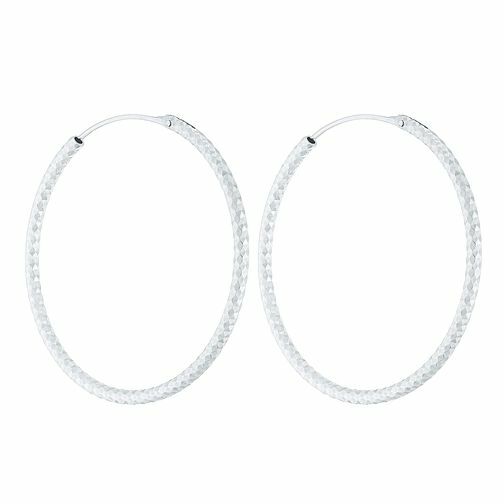 Designed for effortless, everyday chic, these large hoop earrings are styled with a pretty diamond cut pattern. Crafted in sterling silver for a modern feel. Sterling Silver Diamond Cut 35mm Large Hoop Earrings is rated 3.7 out of 5 by 7. Rated 1 out of 5 by Anonymous from Shockingly bad customer service! I ordered a pair of earrings for my neices Christmas present which confirmed by email. A week later I received a curt, short email advising me that the order had been cancelled as they were out of stock. I cannot understand why this information was not known by H Samuel when I place my order.